This is a sponsored post written by me on behalf of Parrot Uncle. All thoughts and opinions are my own. Home. It's where we do life with our loved ones. It's where we can find shelter not only from the literal elements, but the storms of life. It's where we lay our heads to rest and recharge for the new day. It's where we gather to eat and refuel. It's where we can be ourselves and forget for a while about the pressures of work and the world. As a stay at home mom and homeschooler, it's where I spend most of my time. There are many times when I am anxious to get out of the house. But for the most part I have come to love being home. A huge factor in me coming to love being a homebody is from making it more than just a house, but a haven. I have found that making it as comfortable and aesthetically pleasing to the eyes as possible plays a huge role in my love of being home. The more I invest myself in organizing, decorating and keeping our home clean, the more I want to be here. Though my husband might not notice every new picture I hang, lamp I have bought or closet I've organized; when he comes home he appreciates the combination of all that I have done and feels the difference. When I choose to make the most with what I have; in this case my home, I tend to want to be here more and take pride in it. I confess this is not always an easy task; especially with my 5 children who leave a trail of disaster in their wake, but I am doing the best I can! I am excited to be partnering with Parrot Uncle an online home lighting store, in helping you to find the perfect lighting fixtures to give your home not only light but ambiance. I am in love with all their creative lighting pendants and lamps and think they would be the perfect addition; whatever your style and budget in turning your home into a haven of comfort and light. -Continually cleaning and organizing aka. not letting things pile up until I am overwhelmed. -Delegating chores to my children. -Buying new items for our home that suit my design style and updating old items. -Decorating with new pictures and finding new combinations for decor and art. -Making all those great ideas that I have pinned on pinterest and being resourceful with what I have. -Using lighting that is natural and low, not harsh or too bright-like these ceiling pendants, Tiffany style pendant lighting, and wooden pendant lights from Parrot Uncle. -Lighting candles, refreshing pillows and replacing household accessories as they wear out. If you want to make your home more than just a house this coming new year, consider what you can do to make it a haven; a safe and comfortable place for you and your family to do life. What are some ways that you are sprucing up your home for the new year? 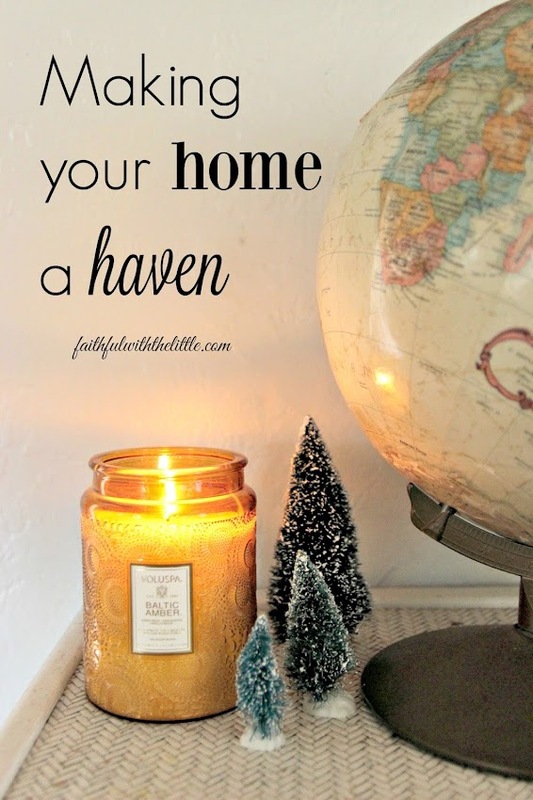 How are you making your home a haven? Check out Parrot Uncle's website and let me know your favorite lamp or pendant! Great ideas and tips. For me, a minimalist, I prefer less is best. I only have out what I use and I keep things easy to clean and organized. With two little ones still living here, my house is anything but organized right now, but it will be after they move into their new home. Happy you shared your heart and home today on Tuesday Talk. Happy New Year. Thanks Michelle! I agree! I try to only bring into our home things that I love. I am constantly going through our stuff and getting rid of stuff we don't need. It definitely is the small touches that make a house a home! This is a lovely post. I find that I love my home more when it smells good too. I love diffusers, or candles at night with beautiful aromas. I smell the diffuser when I walk in the door and it makes me feel good. so true! Hospitality is so important! I so need to work on my home. I would love to be able to decorate the way I want to but being a stay at home mom on a super tight budget, I don't always feel like I have the money to buy these "extra" things. Would love some tips on reaching out to companies for product reviews. I need some secret tips. Thanks for sharing with us at Sitting Among Friends. I always look forward to your posts. Thanks for sharing this with us at the 100 Happy Days blog linkup! Have a terrific afternoon. Congratulations! Your post was featured this week at So Much at Home! I hope you will come link up again this week. God bless. Oh awesome!Thanks so much! I'm excited to link up with you again!